Holy moly. 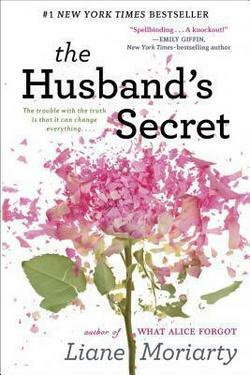 I read The Husband’s Secret in three days. It would’ve been one day had I no children or a coonhound who wants to play RIGHT NOW IMMEDIATELY all the time. I’ve not read any of Liane Moriarty’s work before, but now I’m turned on to her. The narrative flits back and forth between three main characters, and once you get used to it you won’t have whiplash. Her writing is crisp and fluid. As a bonus, the story is set in Australia. First, there is Cecilia. Her husband, John-Paul, wrote a letter to her many years ago, just after their first child was born. The letter was lost, or so John-Paul thought, but it resurfaced in Cecilia’s hands all of a sudden. It takes her about 100 pages to finally open and read it. Shock ensues. Then there’s Tess. Her husband, Will, and cousin, Felicity, who is more like a sister than cousin, announce that they are in love. Life changes immediately. More shock. Finally, there’s Rachel. She lives in a world of hurt every day because her teenage daughter was murdered twenty-some years ago. Making matters worse, the man she believes to be responsible for Janie’s death is a the P.E. teacher at the school where she works. Every day is a black cloud. Plus, her only son is moving to New York with his wife and son, Rachel’s only grandchild. Life for these three women is chaos with crazy in the middle. They are all hanging on by a thin, fragile thread, so you can imagine how intense it gets when their three lives collide. Buy The Husband’s Secret here. Read What Alice Forgot by her…..it is an awesome book and an equally quick read. My book club had one of its best discussions ever after reading it.